Pallet Racking can hold up to 9000kg per bay. That's about 8 small cars sitting on a few pieces of formed metal. So, it needs to be strong, well-made from the correct materials and maintained correctly. As a business owner you want to avoid having accidents with your shelving -- you injure staff, you damage stock -- and you can be heavily fined. That's why there is an Australian Standard for Pallet Racking: AS4084-2012. This standard runs to hundreds of pages and sets out in great detail how racking should be manufactured; and how it should react to being overloaded, hit with a forklift or other heavy object. Many importers of pallet racking will confidently claim that their racking is manufactured to AS4084 - but how can you be sure? It is an easy claim to make but much harder (and more expensive) to prove. 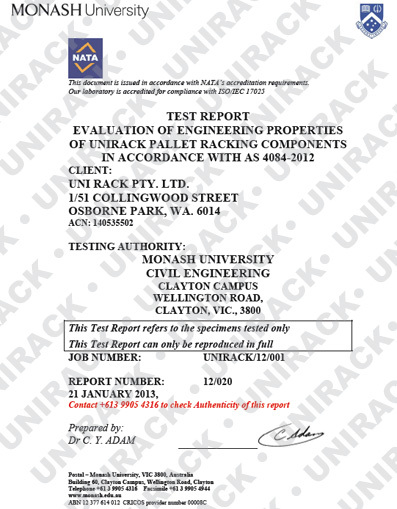 We have had our racking tested to AS4084 by Dr Con Adam of Monash University in Melbourne. He is a very thorough professional. Our uprights and beams went through an exhaustive series of tests over a couple of weeks. Your Obligations under AS4084 As the owner of the racking, you have an obligation that it is installed correctly (we can do that) and that it is maintained well. You should do annual inspections to make sure there is no damage to any uprights or beams, that the footplates are still properly dynabolted etc. If you see problems or there has been an impact with your racking (eg a forklift drives into it), you should probably replace the beams or uprights. It's just good practice. Imagine the nightmare of bureaucracy, insurance, fines and hassle you would get into if the racking failed after an identified problem wasn't fixed. Have a look at this youtube video ofdamaged racking collapsing. Conclusion Only buy racking that is tested. Make sure it stays in good condition.